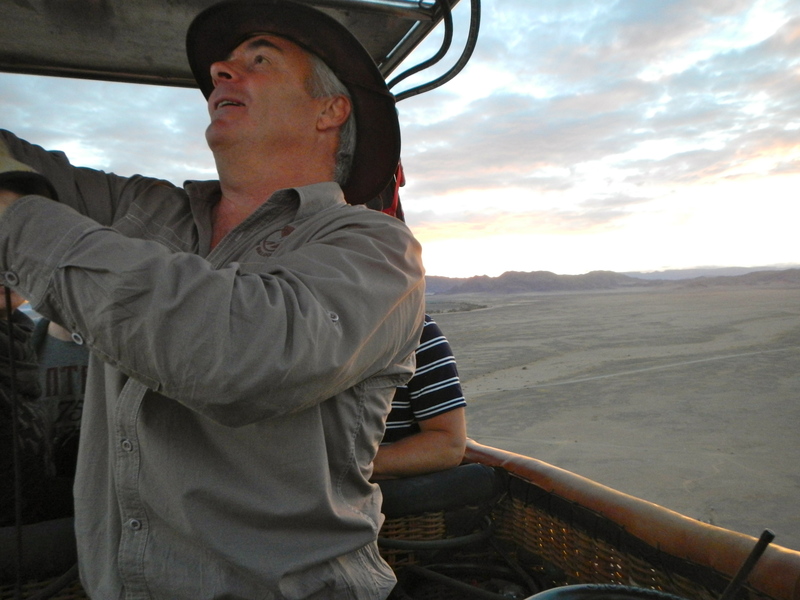 After a light breakfast, our guide Simon drove us to the take-off sight in the pre-dawn light. There was a slight breeze but the sky was clear – perfect flying weather in my estimation. But, Simon said several times that he hoped our flight would not be cancelled. Truly, it was only a little breeze, especially by Texas tornado standards. It would not have ruffled a perfect Texas hairdo, even without the usual gallons of Final Net. Not that I was perfectly coiffed, mind you. A wide-brimmed hat was pulled down tight on my head to shield against the African sun, sure to emerge with a vengeance. 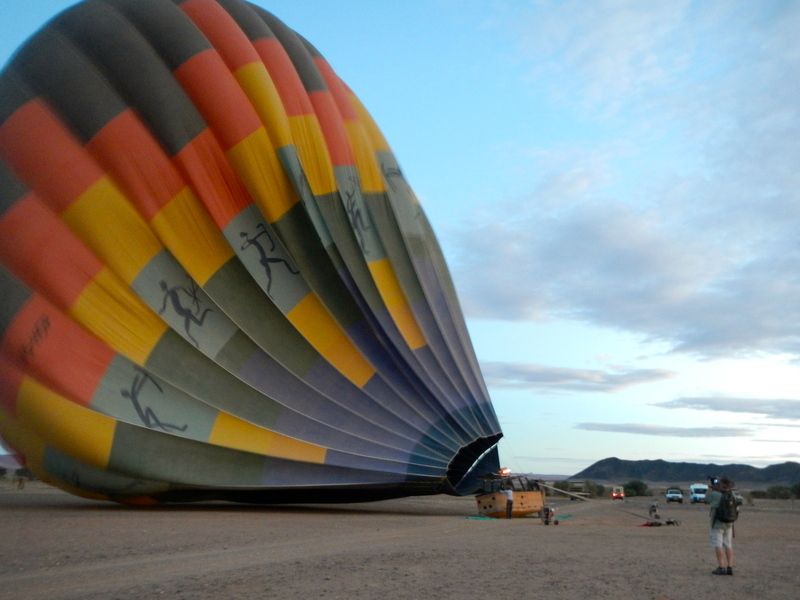 As we approached the waiting balloons, I could see why we might not make the flight. Two balloons laid on their sides, flames leaping into their bellies, as a crew of eight to ten men struggled to keep the attached baskets in one place. The breeze was picking up and the men seemed in a hurry to get everyone loaded and off the ground. One balloon had a much larger basket which held up to sixteen people, while the smaller one held only eight. We were relieved to find we were assigned to the smaller balloon. Spending our dream flight squashed like sardines into a tiny basket was not exactly what either of us had in mind. The larger balloon, which we later learned was twice the size of ours. 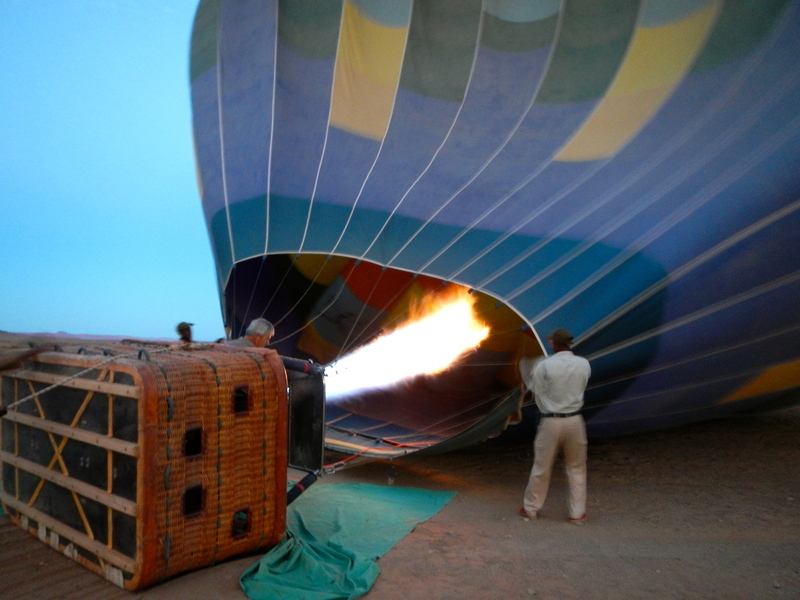 Filling up our balloon. Careful not to singe the ropes, please! The sun was coming up quickly! Success for the larger balloon, but ours was still being tossed about by the wind. The people in our basket are the ‘fly-boys’ and the pilot struggling to fill up the balloon. The larger balloon took off just as I had always pictured. 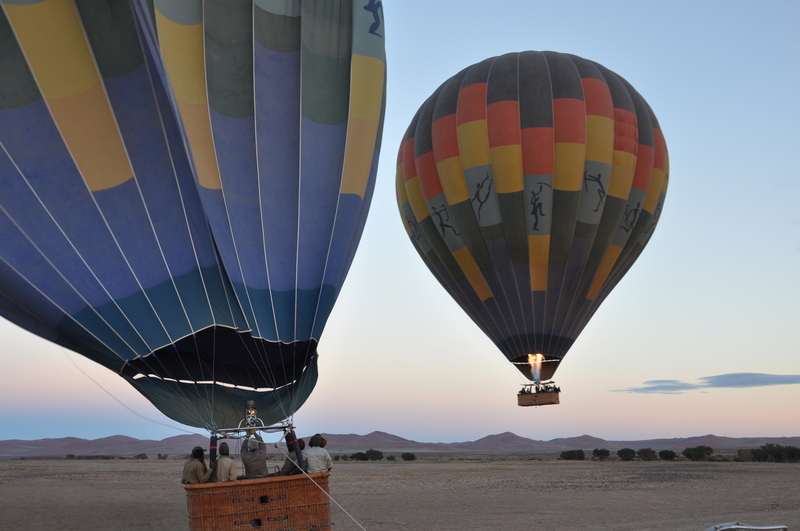 Despite being packed closely together, the passengers all waved happily as they lifted higher and higher into the air. At last, the crew gave us the signal to board. Our basket was divided into four corner sections, which held two people each, and a middle section for the pilot and his equipment. Hubby and I scrambled into our compartment, and joked that we were definitely in first class and the rest of the basket was coach. First class or not, we were quickly snapped to attention. A sudden gust of wind catapulted the balloon forward and threw our basket onto its side. 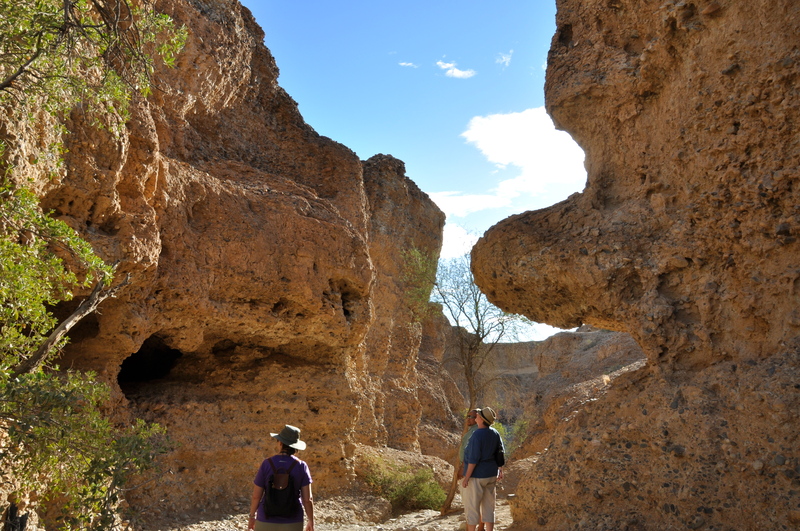 We found our faces within inches of the desert dirt. Our side of the basket was on the bottom, so we were lucky to have grabbed the internal handles, rather than the top of the basket. We would surely have smashed our fingers or worse if we had grabbed the top instead. How many times have you been told to keep your hands and arms inside of a moving vehicle? Always good advice to follow, as our “vehicle” was definitely on the move now. The wind dragged the balloon sideways, with the basket skidding and bouncing along on the ground. Clearly, this was not the direction any of us wanted to go. 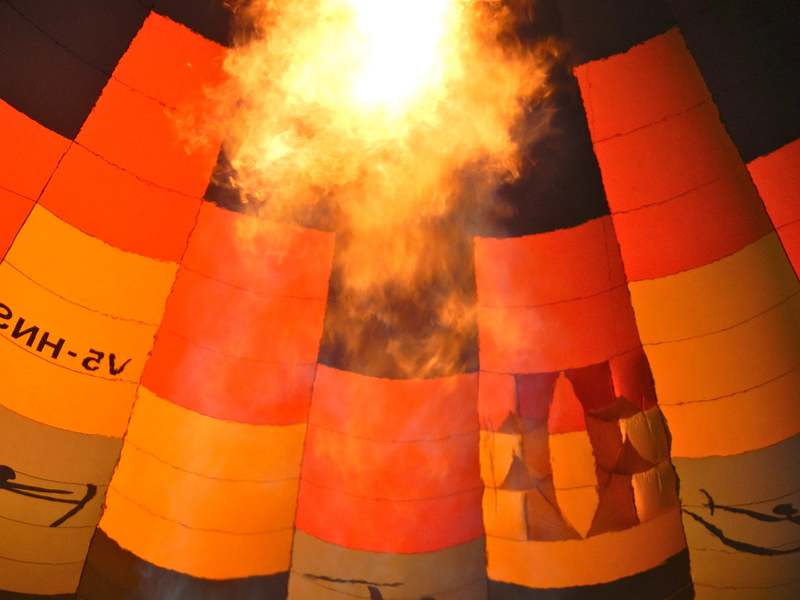 Chaos ensued as the pilot struggled to direct the flame into the belly of the rapidly deflating balloon, while doing his best to avoid catching it (or us) on fire. Thankfully, while all of this was going on, we were able to crouch down inside the relative safety of the basket. There was so much noise and jerking about, we had no idea how far we had been dragged – or if we would soon find ourselves turned completely upside down. Our camera equipment and backpacks were an added liability, as we needed both hands to hold on for dear life. In the heat of the moment, I had the foolish thought that they might call a halt to the flight and tell us all to get out. I quickly realized the only way out in that situation was to be thrown out, and that was not something I was keen to experience. After several minutes of this, our arms and legs aching from trying to stay in one place and not smash our cameras, the bouncing finally stopped and we were told to emerge from our hiding place. I was completely shocked to find we were hundreds of feet in the air! When we finally had lifted off, we lifted off like a shot! 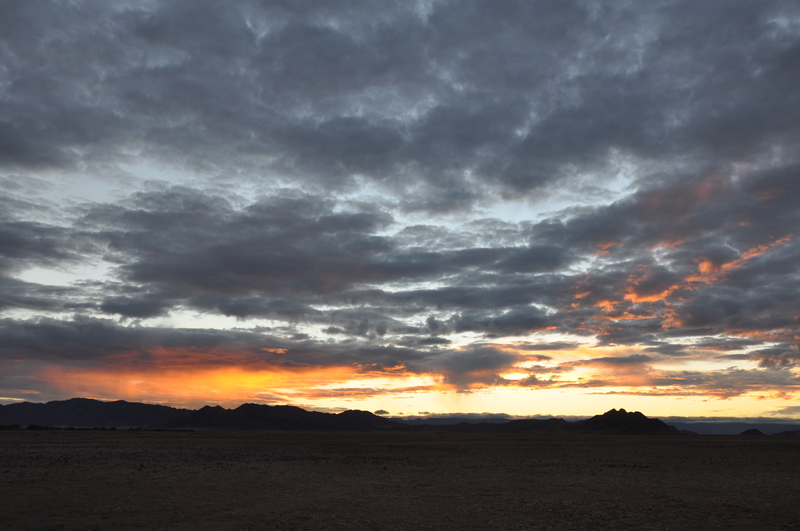 The sun was just peeking above the horizon, and we were rewarded with a breathtaking view of the desert valley and the red dunes of Sossusvlei in the distance. 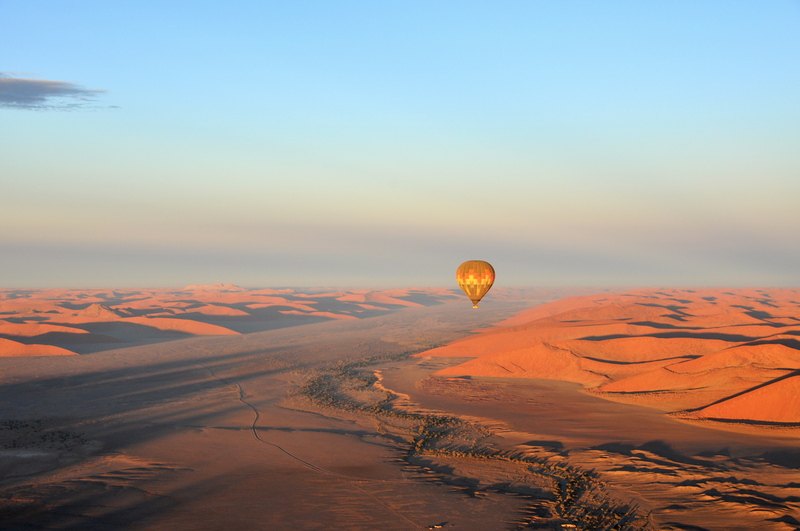 One benefit of flying with a buddy balloon, lots of beautiful photos! 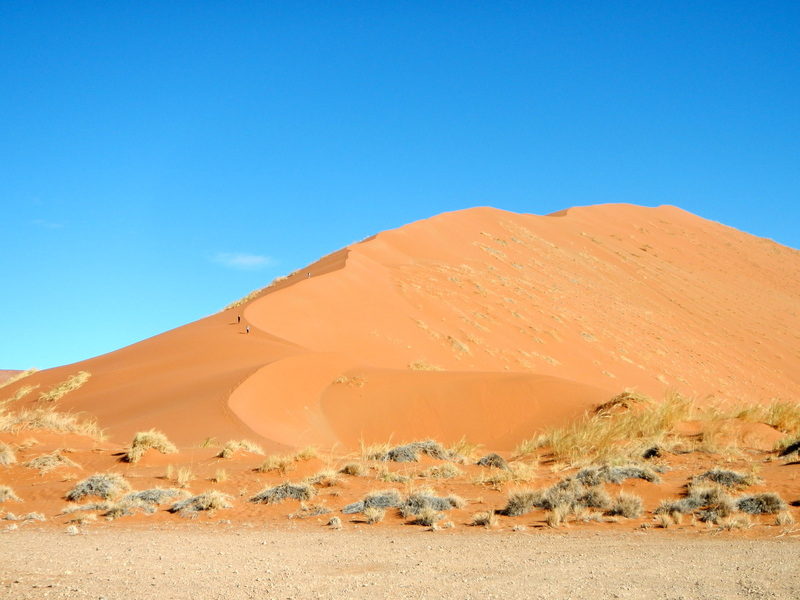 The red dunes of Sossusvlei are a stunning backdrop as well. Once we had all calmed down, our pilot informed us we had just experienced what they call a ‘sporty take-off’. Ha! ‘Sporty’ was a funny way of describing being dragged along like a tire tied to the back of a tractor. He seemed to take it in stride, but a fellow passenger who had flown twice previously, said she had never experienced that before. She had experienced a ‘sporty landing’, however, which sounded much worse to me! I tried to put that possibility aside and enjoy the lovely scenery. It was all completely out of my control anyway, so there was no point in worrying about it. The larger balloon radioed wind information to our pilot throughout the flight, instructing us to go up or down to catch faster or slower layers of wind. I had worn a jacket thinking we might be chilly as we flew. I didn’t count on our on-board fireplace! Our pilot, a very capable twelve-year veteran flyer from South Africa. Despite the bumpy start, we were in very good hands. 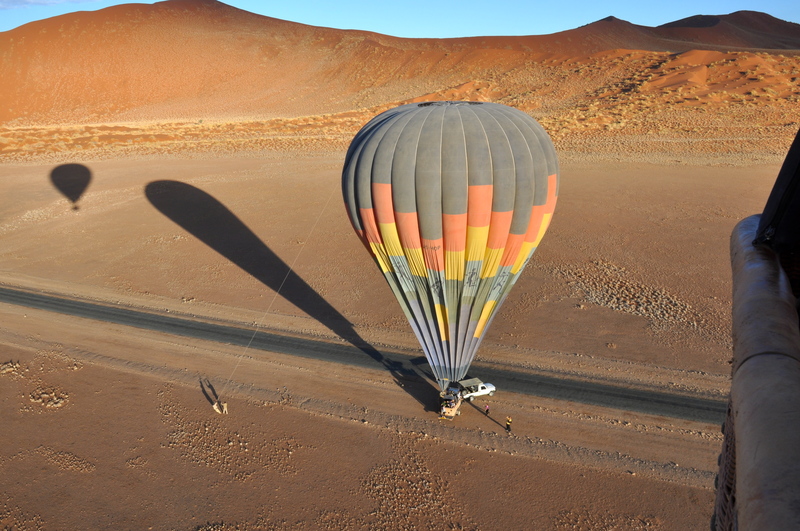 As we flew along, with only the occasional sound of the flame, the pilot told us all about the desert flora and fauna below us, and we spied a few animals wandering along. The landscape was so colorful, with the morning light casting a golden glow on the valley floor, bordered by the bright orange dunes on both sides. We never flew directly over the dunes, as they would have been unsuitable for a landing sight, and we needed to be able to go down when the wind was right. The pilot shared a few stories of other places he had flown, and a little about the characteristics of previous groups of passengers. The Germans, he told us, love rough take-offs and landings – even better if some blood is spilled. On our take-off, one lady had required a band-aid, so technically there was blood involved. Unfortunately for the one German couple on our flight, they came away without a scratch. They still had a good story to tell, but no proof to flash around. The Japanese, he said, are so busy taking photos of each other and themselves, they probably don’t know they made it off the ground until they look at the pictures later. The French are universally unimpressed and unhappy, no matter how it goes. And the Italians inevitably break into song. He said one group of Italians contained an opera-ready fellow singing Nessun Dorma as they sailed over the desert. Imagine the goosebumps from that! He never said how Americans typically behave, which was probably for the best! Of course, all of these stereotypes were only for humor’s sake, and we all had a good chuckle. All too soon, it was time to land, and the pilot gave us instructions on positioning ourselves in the event of a sporty landing. Thankfully, the wind had completely died down, and we were able to land so gently that we ended up exactly on top of the trailer behind our vehicle. Talk about a postage-stamp landing! 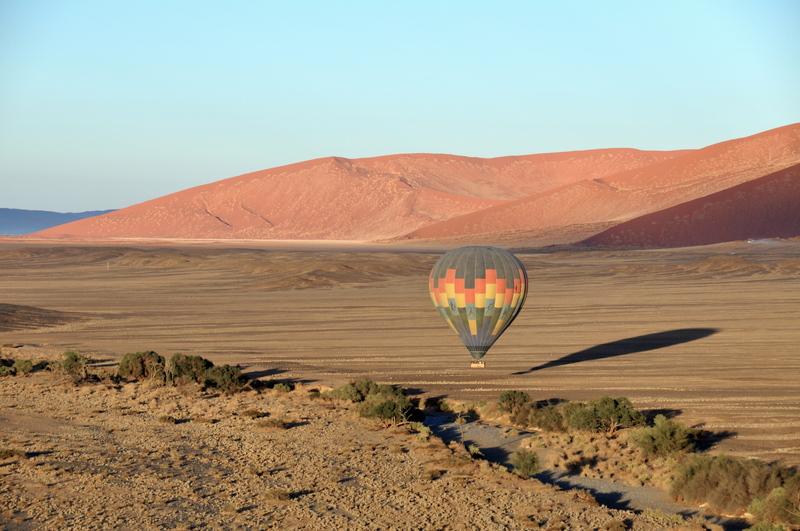 A picture-perfect landing for the first balloon. The shadow in the upper left is us! 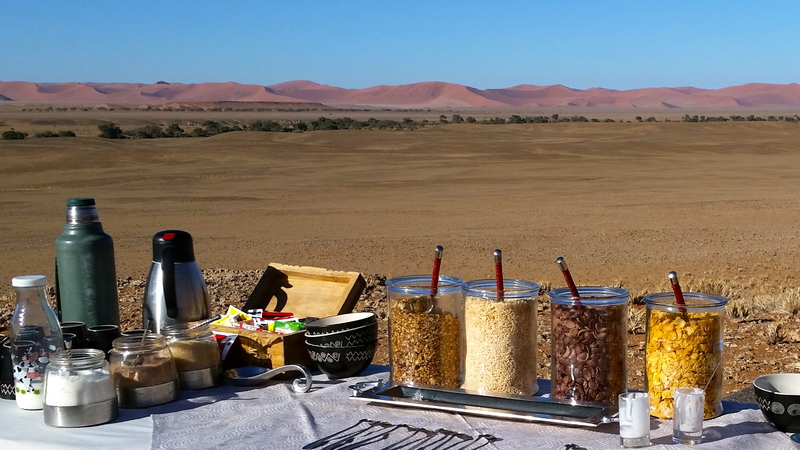 After our lovely landing, we were treated to a delicious breakfast with the red sand dunes as a backdrop. We were welcomed with a champagne breakfast in the prettiest of settings. Our landing spot was on the edge of the dune area. A little teaser for what we would be doing tomorrow. After our very early morning – and all of the excitement – we spent the afternoon relaxing in our bungalow. 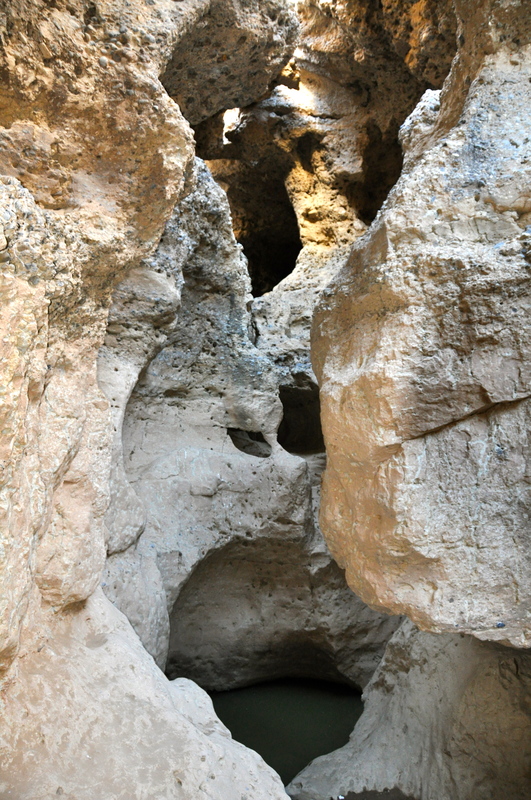 Before dinner, we took a short outing to nearby Sesriem Canyon, a surprisingly deep canyon carved by the very infrequent but sometimes heavy rains that occur in the area. A rare pool of water, here in this desert nation. Every place that water occasionally flows is called a ‘river’, something we had to get used to as we traveled through the area. 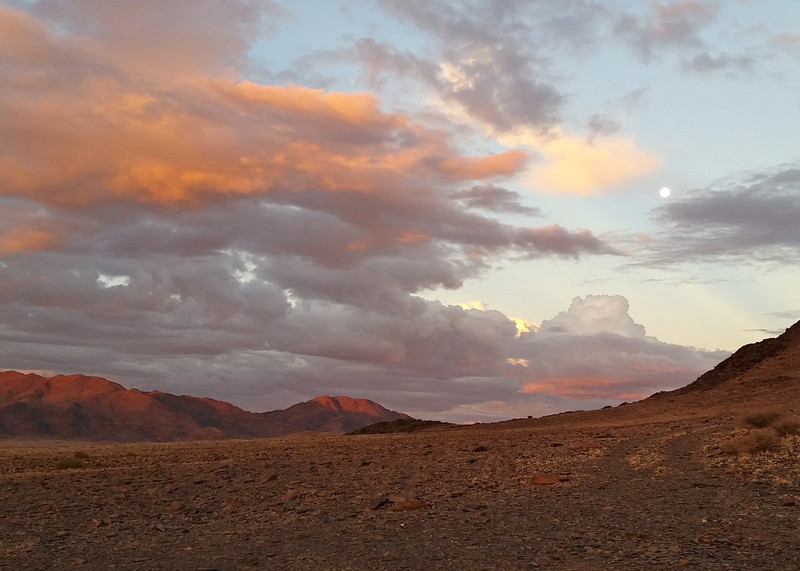 After our tour of the canyon, Simon took us to another sundowner spot and we were treated to a moon rise and sunset from the same viewpoint.